With the increased demand for flat panel displays the need for high clarity multi layer display film is a must to maintain market share. 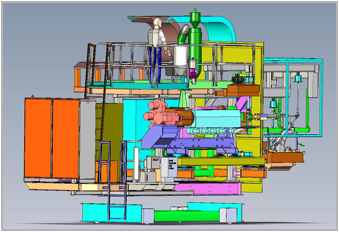 We worked with a team of process engineers on the expansion of an existing extruding machine. The upgrades would allow two processes to be completed at one time and decrease the risk of damage to the film from handling. In order to meet the requirements of the new system and maintain minimum installation downtime, a new control panel was designed and fabricated. The panel was designed to house a new PLC, a modular bus system for heating controls, and variable frequency drives for control of the 100 horse power extruder and associated melt pump. The new control system was integrated into the existing process with a control net network. Two additional operator interface panels were installed for operator control at the machine and also in the control room. Our scope included providing the process control design, software and graphics development, custom manufactured control panel and engineering support during the transition to the new system.